Holiday.gr - Volos, a trip to a myth! Volos is the capital city of Magnesia and the biggest city in Thessaly Prefecture. 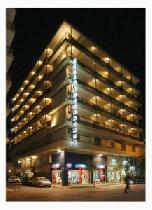 It lies in a privileged geographical location between Athens and Thessaloniki cities. Volos is 325 km from Athens and 216 km from Thessaloniki. The modern city of Volos is built at the edge of Pagasetic gulf and at the foot of Pelion mountain, very close to the ancient Iolkos town. Volos is an urban city, a major commercial port and the industrial center of Magnesia Prefecture. The city was architecturally devastated after the 1955 earthquakes. The residents of Volos managed to rebuilt the city and create a different urban plan. A walk around the city will reveal you the harmonious coexistence of traditional and modern architecture. The City Hall is a typical sample of the Pelion architecture. The same building also hosts two Municipal Picture Galleries of Greek painters. The Papastratos Tobacco Warehouse is a striking architectural example. 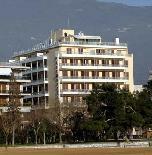 It now hosts the Pedagogic Department of the University of Thessaly. During your stay in the city, it is worth visiting some of the most beautiful churches, such as the church of Saint Nicholas, by Aristoteles Zahos and the church of Saint Constantine with the characteristic chambers. It is worth visiting the Anavros open-air sculpture gallery as and the Archaeological Museum of Volos. The Museum exhibits important displays, such rare steles of the 3rd BC and a rare collection of prehistoric findings. Sesklo, one of the most significant prehistoric settlements in Greece lies very close to Volos. It is estimated that Sesklo was first inhabited during the 7th BC. The excavations have brought into light the remains of a palace and a castle. Just outside Volos city, in Dimini, you will see the remains of a prehistoric settlement. Dimini flourished from 5250 BC to 4400 BC. The excavations brought into light the remains of many residences, utensils and other tools. These findings are exhibited at the Archaeological Museum of Volos. Volos is a city offering different activities depending on the season you visit it. The proximity to Pelion makes Volos ideal for those wanting to explore this mythical mountain as and the surrounding beaches. During winter time, the ski center offers endless moments of exercising and entertainment, while in the summer Volos beaches are a paradise for the lovers of sea. If you want to have fun, then Volos is the place to be. Restaurants and traditional taverns serve unique dishes from the local cuisine. At night, bars and clubs with live music will entertain you till dawn. For your accommodation, Volos has many hotel complexes that offer all modern comforts to their guests. Been to Volos ? Share your experiences!